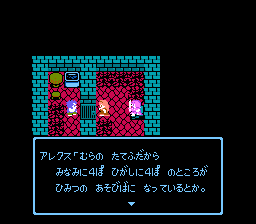 So you're playing some RPG in Japanese and there's a "map," or chizu 地図, and someone tells you which cardinal direction you have to go to complete the current quest, but there's a problem: you have no idea how to say north, south, east, west in Japanese! Now go questing. Or stay, and read more about Japanese. Context: Alex talks about what he heard from the children. 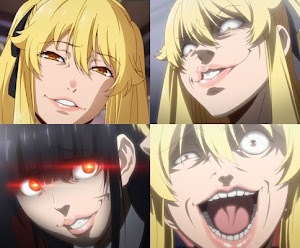 himitsu no asobiba ni natteiru toka. there's a secret playground or something like that. Hey! What's going on here?! We just mixed the kanji characters of the cardinal directions together, but now the kanji are read totally differently! Why is "northwest" in Japanese hokusei 北西 and not kita-nishi 北西? Short version: it's because the word is hokusei, not kita-nishi. That's just how the word is. Long version: it's probably because Japan had a word for "north" that was kita. When Japan imported the kanji from China, they saw that 北 meant "north," so they started writing the word kita with that kanji, as kita 北. When a native Japanese word gets written with kanji, that word is said to have the kun'yomi reading of the kanji. Meanwhile, the ways that kanji was read in China before it was imported into Japan are called on'yomi readings. So kita is a kun'yomi of 北, while hoku is an on'yomi of 北, because kita existed before the kanji was imported, while hoku is loosely based on how the kanji was read in China hundreds and hundreds of years ago. This means that hoku isn't a Japanese word, it's merely a way that kanji was read. But if hoku is a reading of a kanji, and that kanji has a meaning, that means that, consequently, hoku inherits the meaning of the kanji. That is: hoku means "north," even if hoku isn't a word. Likewise, sei 西 means "west," even if sei isn't a stand-alone word. From there, someone combined these meaningful non-words to form hokusei 北西, which means north plus west, "northwest." By the way, meaningful word-parts are technically called "morphemes." 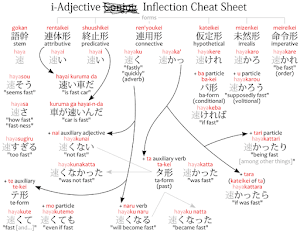 North and west are morphemes of the word northwest, just like hoku and sei are morphemes of the word hokusei. The secondary intercardinal directions are made by repeating one morpheme. For example, "south-southwest" would be nan-nansei 南南西, while "west-southwest" would be sei-nansei 西南西. In the case nan'nansei 南南西, nan'nantou 南南東, hokuhokusei 北北西 and hokuhokutou 北北東 sometimes the iteration mark noma 々 is used. Example: hokuhokutou 北々東. 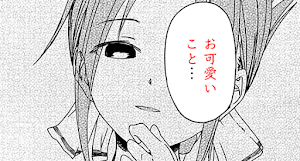 One thing to note is that, although the kanji for nishi 西 has a sai 西 on'yomi reading, it doesn't have a zai reading. 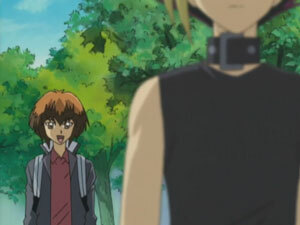 Likewise, it's hoku, not boku. So what is going on in those words? This is a change in pronunciation called rendaku 連濁. 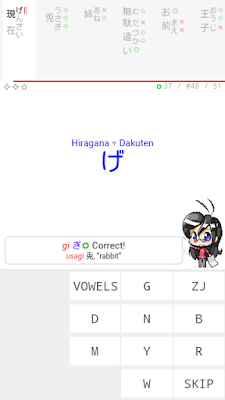 Basically, it adds a dakuten 濁点 diacritic to the latter morphemes of a word to make it easier to pronounce. 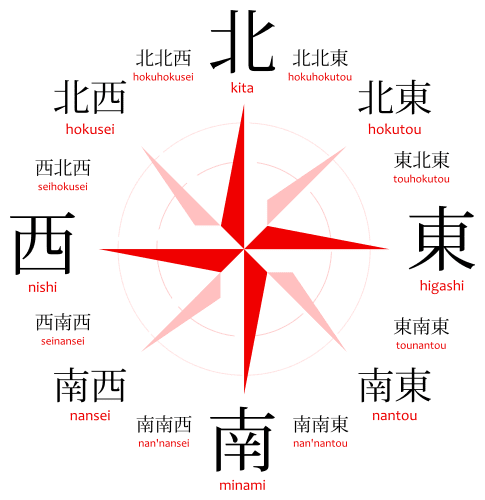 There are two words that mean "the four cardinal directions" in Japanese. The first one is touzainanboku 東西南北, which is literally "east-west south-north." This one is very explicit about the cardinal directions so there's no mistaking it. It's also considered a jukujikun 熟字訓, a "four-character idiom," because it has four characters, which are the four directions. The second one is shihou 四方, literally "four directions." This one is a bit tricky since it can mean other four directions too, or things that are in all four directions (around you). Lastly, this isn't strictly about cardinal directions, there's jippou 十方, which is not four, but "ten directions." Yeah, that's right, ten directions. Which directions are those? North, south, east, west, northeast, northwest, southwest, southeast and... there's only 8 there.... uh... up and down. Yeah. Up and down. That's how you get 10 directions total. A single "cardinal point" or "cardinal direction" in Japanese is called houi 方位. A "compass," like a pirate's one, which shows the direction, is called houi-jishaku 方位磁石. The jishaku 磁石 part alone means "magnet," which is how compasses work, with "magnetism," jiki 磁気. If you have ever actually seen a compass, even the simple rose of winds on a map, you might recall that nobody actually writes out north, south, east and west. They use acronyms, only the first letter: N, S, E and W.
So what would be the equivalent in Japanese? That'd be nothing, because a single kanji (北) is already equivalent to the entire word (N). You don't need to abbreviate the Japanese word for north in writing because it's already short enough. It's "fist". Thanks for noting.